David Hastings is an instructor at the Northwest Renewable Energy Institute (NW-REI) located Vancouver, Washington. 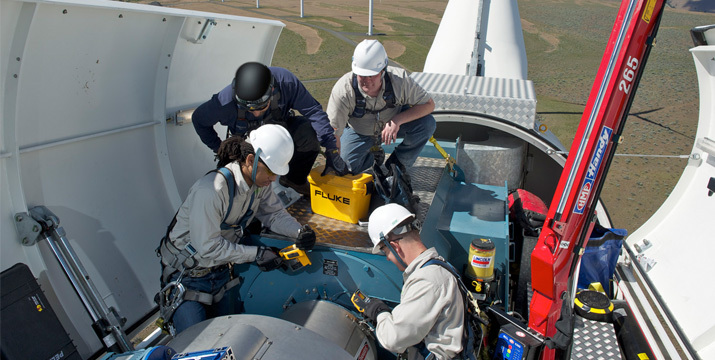 NW-REI focuses on helping grow renewable energy sources such as wind power, and is taking the necessary steps to train and prepare students for careers in wind energy. Hastings understands the importance of proper training, and knows that working with wind turbines requires a broad range of skills in electrical, mechanical, hydraulic, and control systems. Included in the electrical training is an introduction to multimeters (according to Hastings, the Fluke 87V Digital Multimeter [DMM] and Fluke 1587 Insulation Multimeter are the industry workhorses), AC/DC electrical systems, electrical relay control, and Qualified Safe Electrical Worker training. Download this free application note to learn more about training and recommended tools.